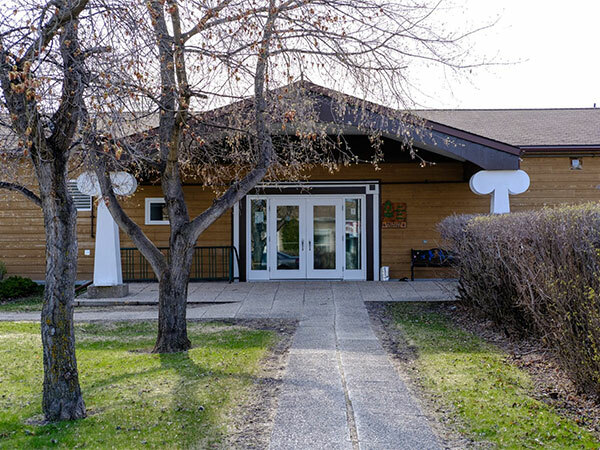 Located on the grounds of the Royal Canadian Air Force Gimli Station (formerly the No. 18 Service Flying Training School, later No. 2 Flying Training School, and still later Canadian Forces Base Gimli) in the Rural Municipality of Gimli and west of the Town of Gimli, the school served the children from the base’s personnel, including those in the Aspen Park residential development, as well as children of the school’s teachers. Named in honour of Group Captain Acheson Gosford Goulding, the first base Commanding Officer, it was opened by Margaret Goulding, his widowed wife, at a ribbon-cutting ceremony around 2 December 1951. In the crowd at the unveiling was Group Captain B. D. Richer, the station’s Commanding Officer. The eight-classroom facility was operated during the 1951-1952 school year by the federal government before being established in May 1952 as a Special Revenue School within the provincial school system. The school operated until the summer of 1971. Manitoba School Records Collection (GR2047), Goulding School District No. 2337 Daily Registers, Archives of Manitoba. [Photo caption], Winnipeg Free Press, 3 December 1952, page 25. Obituary [Jorun “Joey” Valdis Thordarson (c1909-1991)], Winnipeg Free Press, 27 February 1991, page 40. Obituary [Allan Joseph Sargeant (1918-1998)], Winnipeg Free Press, 21 September 1998, page C7. Obituary [Olga Capar (1932-2011)], Winnipeg Free Press, 8 January 2011. We thank Deanna Colwill Penney and Christine Loff for providing additional information used here.